Dr Andrews qualified and gained her degree at The Royal London Dental Hospital in 1989 [BDS]. In the same year she became doubly qualified by taking an exam at The Royal College of Dental Surgeons [LDS RCS Eng]. Karen’s first job was in Grays, Essex working for Dr Datta who was a fantastic mentor. After one year she was leasing her own practice in Wickford Essex, and after expanding this practice to a two surgery practice, she then acquired Village Dental Care (now Distinctly Dental) in 1994. It is here, that she has found her niche and love for dentistry; 23 years on, she is still here and intends to stay until her last working day. 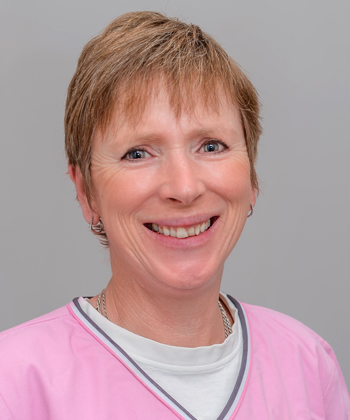 Initially Village Dental Care started as an NHS practice, however, as the NHS became more and more restrictive and frustrating Karen started to convert her practice to a private surgery in 1997. At the same time she embarked on further training at the Eastman Dental Institute acquiring a diploma in restorative dentistry so she could deliver the quality private dental care her patients deserve. Karen is constantly going on postgraduate courses as it is her passion to provide the best possible care she can for her patients, keeping up to date with the latest techniques and technology. Notably, in 2007 she acquired her diploma in implantology, and in 2008 she embarked on some major training at the world renowned Pankey Dental Institute in America. Karen’s philosophy is all about quality dentistry; she does her best to have all the latest quality treatments at her finger tips and, most importantly she actually shows and explains to her patients any problems they may have in their mouths. She then explains in detail all the various treatment options, so that together with her patients the right treatment option, personal to them is chosen. Apart from dentistry Karen spends her leisure time with her beloved horses having a passion for natural horsemanship. When she is able to take time out of her busy schedule, she loves to travel and plans to embark on further volunteer trips to lend her skills to those in need. For more information on any of our services or to book an appointment call us today on 01707 263 404 or make an enquiry.